It’s worth more than you think! You'll be happier, more productive, and more able to help others! Serious Question: How much would it be worth to you if October-December of 2017 becomes your most productive quarter ever? What would that be worth? What if that productivity continued into 2018–what would that be worth to you? 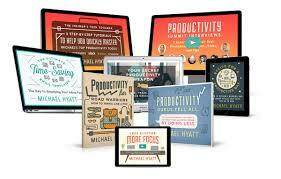 I believe that Michael Hyatt’s Free to Focus course on your personal productivity is the best in the world. Why? Because it’s not so complicated that you’ll say, “Forget it,” and it is laid-out in such a way that keeps you looking forward to the next day. But today is the last day you can get it for another year (the fun course has an ironclad money back guarantee). Truth in Advertising! I purchase Michael Hyatt’s products for myself! I love them and I recommend them to others. If you purchase his program through the link below, I receive a little bit of compensation from Michael for “recommending” you. I truly don’t know how much (and I don’t care). It’s just a great product with risk-free guarantee. Just take a look at it because it goes away tonight at midnight.